These incredibly radiant 1.47 Carat t.w. 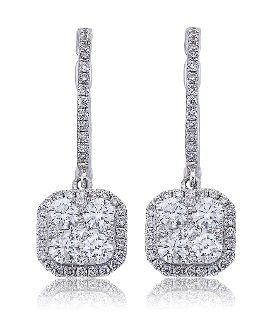 Diamond halo earrings are designed with an attitude, for a lifestyle, and make a statement. Featured here are a total of 94 Dazzling Diamonds illusion set with a square pave halo in modernistic open worked basket style setting. They shimmer and sparkle as light bounces through them. This glamorous pair of pave Diamond embellished earring with dangling Diamond halo clusters, are just waiting to take you to your next event. Fashioned in highly polished 14 Karat white gold and secured with latchs backs we think these are a must have for that special someone.